Washington Post, You’re So Awesome & Frustrating All at Once. An article in the Washington Post Style section from today picked up not one, but two of my comments on the New York Times article from last weekend — but incorrectly attributed one of them (the more thoughtful, well-written one….of course!) to DCist. Forget snark, forget snobbery – the thing that is so wonderfully refreshing about Tim Gunn is that he presents fashion as something everyone can and should enjoy. It comes, I think, from his history as an educator and his appreciation for fashion’s historical significance. 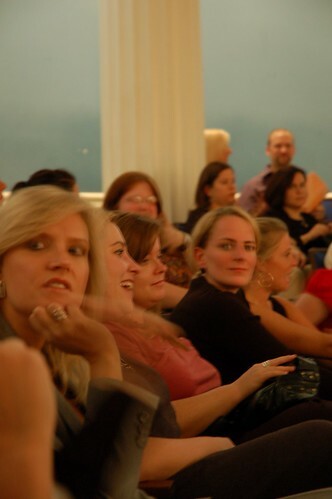 I saw so many different types of people as I looked around the room last night at the Corcoran. Mostly women of course—but women of all shapes, sizes, ages, and taste in clothing. And they were all just completely charmed as hell by Tim Gunn, who was just as gracious, funny, and welcoming as he always is. Besides showing slides from NY Fashion Week, he talked about his new role as Chief Creative Officer for Liz Claiborne Inc., praised Marc Jacobs and other innovative American designers like former students Lazaro Hernandez and Jack McCollough of Proenza Schouler, and best of all uttered the phrase “makes my bile writhe” to describe bubble skirts. Innovation was certainly the buzzword of the evening: innovation on the runways, a more nurturing and accepting fashion industry post-9/11 that has helped to fuel that innovation, and shows like Project Runway that cultivate interest in emerging designers. Throughout his career, innovation has been a Tim Gunn priority – first when he joined Parsons & ruffled a bunch of feathers by doing away with stodgy programs at the school and now in his new challenge of helping to reinvent and reposition Liz Claiborne, who was an innovator in her own right. 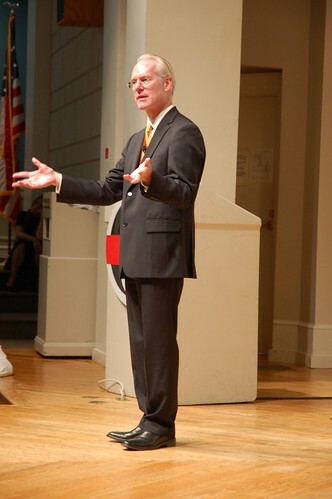 At the end of the night he said, “Fashion has never been in a better place.” It appears that neither has Tim Gunn! ** Check out this nifty little contest I found on the Liz website! WHAT: Local crafty bastards selling everything from clothes to jewels to home & baby goods, plus food, music, and some of the best people watching ever. WHERE: @ The Marie Reed Learning Center (18th & Wyoming) in Adams Morgan. WHEN: Saturday Sept. 29 from 2:30 – 6:30 with an afterparty at Bourbon. DETAILS: Bubbly, sweets, a free gift with any Julie Haus purchase and the chance to win a $100 store gift card and a personal style consultation with in-store stylist Erin Ward. Jenna’s Ring: Yea or Nay? Yeas & Nays posted this yesterday – what do we think, PBers? 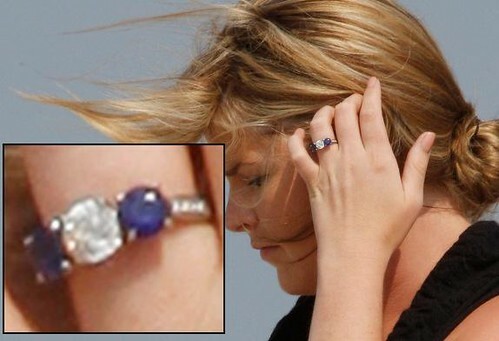 And….do you think the ring choice will have an effect on trends?